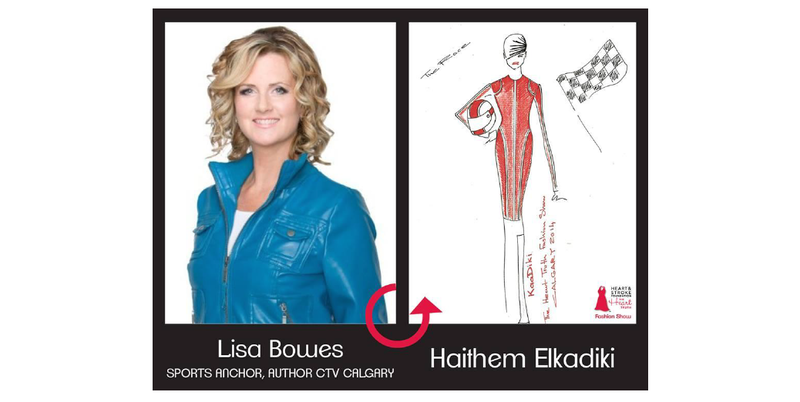 In this second part of my interviews for the Heart Truth Calgary Fashion Show I stopped by Haithem Elkadiki's studio and got a look at his designs under his label KaaDiki for Lisa Longball and Lisa Bowes. As one of the designer had to drop out, Haithem took the task of creating two dresses that will be going down the runway. Two dresses and two Lisa's. Fun! Lisa Bowes has been recognized across Canada for her work as a sports reporter, live host, anchor, play by play announcer and producer. She is currently based in Calgary at CTV and freelances for TSN. She is also a Gemini nominee, children's book writer, and volunteers with the Calgary Board of Education to name a few things. Lisa Longball is currently ranked top 4 in the World in Ladies Long Drive. 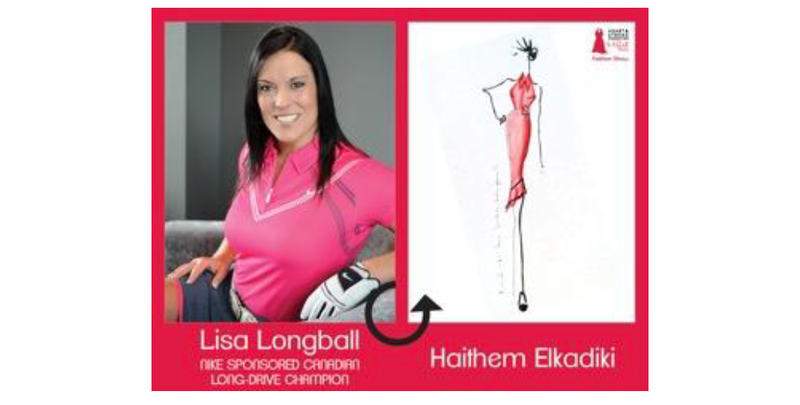 She has won 7 consecutive National Long Drive Championship titles, is an LDA Tour Champion and a Nike sponsored athlete. In addition to her competitive career, Lisa is a golf journalist for several publications including Inside Golf Magazine and has had her own column in Golf Digest Canada and Back9Network. I am inspired by my amazing models Lisa Bowes and Lisa Longball. Lisa Bowes's dress was inspired by Formula One racing and Lisa Longball's look was inspired by the Italian movie "THE GREAT BEAUTY". What made you want to create a design for the event? I wanted to create designs for The Heart Truth Fashion Show Calgary because it is a great cause that is close to my heart. Were there any special elements that went into your design? There are several elements and special design details that went into each creation. Lisa Bowes's dress is all about the racing stripes that are carefully stitched on the entire garment + the Ferrari Red color choice. Lisa Longball's look is all about Romance and La Dolce Vita which meant that to achieve that look I applied ruffles, tulle and Gross Grain Ribbon to the garment. Did you take in account the person wearing your design? was there collaboration? Collaboration is essential to the design/ creating process after all it is all about my models and not me the designer. It is about delivering creations that Lisa and Lisa will feel good about wearing. How long did it take to construct? What was the most difficult part? I did not keep track of time too busy enjoying the process and having a great time with Lisa B and Lisa L. The creating process for me is about the flow of good energy and to treat any difficulties as blessings. What was your favourite part of creating the dress? You can help support this cause by purchasing tickets or donating here. This is a fabulous event for Calgary to support! I look forward to seeing KaaDiki on the runway this weekend! !